Purpose: Use this document as a reference on running delivered Reports, Jobs, and delivered Queries in ctcLink. What are ctcLink Reports, Jobs, and Queries? A Report in ctcLink is an existing report that has defined elements. Jobs are collections of ctcLink processing tasks. The term job and process are often used interchangeably. A report is considered a job, so the directions for running a report and job are the same. A Query is a tool used to retrieve selected data. Who will use ctcLink Reports, Jobs, and Queries? Finance, HCM, and CS staff when functional reports or data are needed. Usage is based on security access. Select Add a New Value if this is the first time running this job. Run Control IDs are tied to an individual user ID and are visible only to the creator. Instead of entering the same values each time a report is run (such as when the report should run and prompts such as BUSINESS_UNIT); a Run Control can be saved with these settings. The next time the report is run, a Run Control ID is selected (in Find an Existing Value), and the system completes the settings with previously defined parameters. Be aware that certain Reports and Jobs may need to have a new Run Control depending on the parameters used. Type a Run Control ID, using alpha numeric characters with no spaces. Underscore can be used for spacing i.e. AP1_LastName. Select parameters for the job. Parameters will vary depending on the job. The next time this job is run, the Run Control ID is entered and the saved parameters will appear. Click Run to add the job to the Process Scheduler queue of jobs awaiting execution. The Process Scheduler Request requires additional choices on how the report/job will run. These choices are Server Name, Recurrence (leave blank if one-time occurrence), and Run Date/Time (when report will run). After scheduling a job to run, the Run Control Page will display a unique Process Instance number. Please note the number; it will be helpful for troubleshooting if needed. The Process Monitor is generally used to track the progress of a job and insure its success. Report Manager is generally used to review the job output of a report. In Process Monitor, the filters can be used to limit the Process List or the existing Process List to see the recent jobs that have been run. The Process List includes Process Type, Process Name, UserID, Run Date/Time, Run Status (Queued, Initiated, Canceled, Success), Distribution Status (N/A, None, Generated, Not Posted, Posting, or Posted), and Details. If the Run Status indicates Success, the reports can be viewed in Report Manager. The Process Detail page contains the Message Log which helps troubleshooting if the report did not run successfully. Click Report Manager to view the reports you have run. Click the Administration tab to see successfully run reports. Click the Details link to view the report. Reports can be deleted on this page for staff with this authorization. Use the following process to run a delivered query in ctcLink. 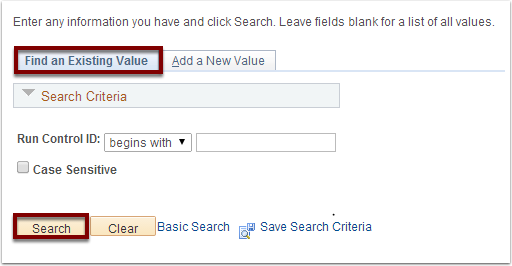 Click Advanced Search to find queries based on selected filters. Enter filters for Query Name, Description, Uses Record Name, Uses Field Name, Access Group Folder (functional query security group), and Folder Name. Within these filters, selections include , ≤, =, , ≥, begins with, between, contains, in, and not. The percentage sign (%) is used as a wildcard character. Additional filters include: Query Type by Archive, Process, Role, or User and Owner by Private or Public. Private queries will be listed and can be run only if the query owner has granted access. After the filters are selected, click Search. The Search Results grid displays queries based on the selected filters. The query can be run as HTML (web-based), Excel, XML, or Schedule a time for the query to run using Run Control ID. The query can be added to favorites for future quick access. Click on the magnify glass to see available look-up options. 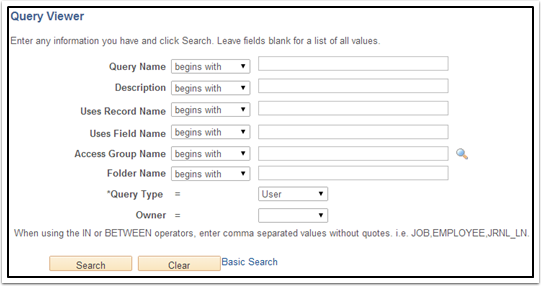 When searching for queries or reports, it is recommended to use Contains for search parameters in Description. Descriptors in Name or Description are often shortened, such as Vendor to VNDR, so multiple searches may be needed.